of Christianity and society in Late Antiquity. This volume brings together studies of a diverse collection of sources - patristic texts, apocrypha, medicinal treatises, hagiography, pseudepigrapha, papyri, and more - illuminating how children mediated the relationship between Christian thought and Late Antique society. 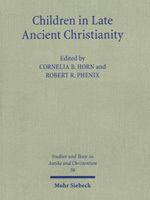 The contributors address the existence of children's culture, medicine and healing of children, disability and deformed children, the economic condition of orphans, theological appropriations of children, the presentations of family relationships in Christian thought, monasticism and family obligations, early Christian response to pedophilia and the formation of Christian ethical identity, and the role of children in apocryphal texts.